Publisher: Front Street; 1 Reprint edition (February 2, 2006). The Plot: Phaedrus is a gladiator in second century Britain; a bloody, violent fight to the death in the arena results in Phaedrus killing his best friend, winning his freedom, and having no idea what to do next. What does a slave know about living as a free man? Phaedrus is approached with a scheme involving the tribes to the North, in Scotland; the king died seven years ago. His son, Midir, went missing; and Levin's half-sister, Liadhan, seized the opportunity to bring back goddess worship and set herself on the throne. The thing is, Phaedrus looks exactly like the missing Midir. Why not put him on the throne instead, and remove Liadhan from power? So Phaedrus pretends to be Midir -- pretends to be King -- and gets more than he bargained for as he begins to realize what it means to be a King. The Good: Non stop action. Chapter One, we get a mother's suicide, gladiator fights, freedom; Chapter Two, a drunk night on the town resulting in fights, stabbings, and fire; Chapter Three is prison and the Midir plan. There's barely a place for Phaedrus or the reader to breathe. 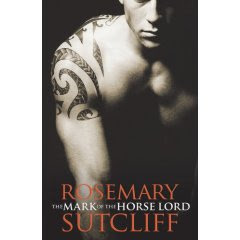 Yet, within all that action, Sutcliff includes many details about the second century Britain. Once Phaedrus agrees to the plan, there's a lot he has to learn. And he keeps finding out that that there is even more involved than he thought. Since this was written in 1965, I was a bit concerned about how the goddess religion would be treated. To be simplistic, it seems like all books about it written before a certain time depict it as Evil; and all written after a certain time depict it as The Golden Age. Silly me; Sutcliff does almost the impossible by making no modern judgments. Yes, the faction that Phaedrus sides with wants the sun centered god religion, rather than the moon centered goddess; and the goddess religion shown involves human sacrifice. But it's done rather evenhandedly; and the religion dispute is more a side issue, with the real dispute being about power, and who has it. What else? There's a map! I love maps; and a brief historical note intro, letting the reader know a bit of the historical context and clearly stating that this is fiction, but here's the true history part. As for the true history part, I love that Sutcliff looks at a bit of history that does not get much written about it. Seriously, how many other books set in second century Scotland are there about the Dalriad? The brutality of the time is genuinely shown; what really happened to Midir, for example. My clues; he's alive; and remember, that a maimed man could not be king. If you don't want to murder a child but do want to make sure he never becomes king, what do you do? Age: I think today, this would be a YA book or an adult book. Phaedrus is about nineteen; there are wars, bloody battles, even a bit of a romance. Part of what Phaedrus has to face is the difference between the best choice for himself; and the best choice for his people. But are they his people -- isn't he just pretending to be King? The cover: isn't that cover great? I read the original hardcover, boring black, but there is a mark on the cover that is supposed to be the mark of the horse lord that Phaedrus gets tattooed on his forehead. Quotes: "[Essylt, Phaedrus's mother] had used the slim native hunting dagger that had served Ulixes as a papyrus knife; but there was not much blood because she had stabbed herself under the breast, not cut her wrists as a Roman woman would have done." In one sentence, Sutcliff tells us how Phaedrus's mother killed herself, also revealing how the native / Roman cultures mixed yet did not mix. On fighting to the death as a gladiator: "Like the sudden opening of a cavern in his head, reality burnt upon Phaedrus, and in that ice-bright splinter of time he understood at last that this was a fight to the death, that he was fighting, not his comrade Vortimax, whom he had fought scores and hundreds of times before, but death -- red rending death such as the stag's had been, and the hooks of the mercuries in the dark alleyway." Again, awesome detail; and lovely how Sutcliff creates a world where you "know" what it is those mercuries do without her ever really saying. While I liked how Sutcliff had the opening note, I would have loved to have the titles of her actual source material. I wonder if the marriage ceremony shown is accurate, and the same for the Women's War Dance. Finally? Amazing, amazing ending. Entirely true to the book and the characters, yet still unbelievable and almost shattering. Now all I want to do is read all of Sutcliff's other books. I love this book--the ending is just stunning. Since I think this is Sutcliff's best book, it's hard to recommend what to read next--Eagle of Ninth, perhaps, for more Romans, or Witch's Brat or Knight's Fee for medieval. Megan Whalen Turner is a Sutcliff fan, and pays homage to her in her own books, most obviously at the beginning of The King of Attolia. Thanks for all the Sutcliff links! I just can't move these titles at my school. I've kept them for ten years hoping that I could, and now that I have to read them, I can see why students don't like them. I'm deaccessioning a lot, and offering them to any student who actually enjoys them. The books need to go to a better place instead of gathering dust here. One of my favorite books, too. I loved reading your review.